We’ve all been there. We’re setting up for a session, and the guitar amp is buzzing like crazy, or we’re opening up a mix to get started, and there’s all this noise on the guitar tracks. 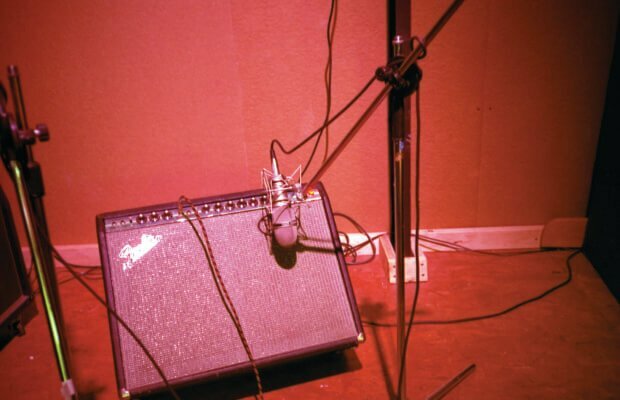 In this article, we’ll look at some solutions for humming amps and guitar tracks, and how to deal with them in the recording and mixing processes. In the recording phase, there are a couple of common offenders, and sometimes it’s more than one thing at the same time! Single-coil pickups in guitars are essentially receptors for electrical interference of all kinds. When working with single-coil pickups, like on a Fender Telecaster, the first test is to unplug the guitar. Does the hum go away? If so, move on to Offender #2. Otherwise, read on. Plug the guitar back in and turn up the volume knob on the instrument. Does the hum come back? If so, the hum could be caused by electromagnetic interference from fluorescent lights, dimmers, computer monitors, or other unshielded sources. Slowly spin in place. There’s usually a “sweet spot” with the least amount of electrical interference — you’ll hear it when you get there. Use a fully blended pickup position. On a guitar with two single coil pickups, the neck pickup has the inverse polarity of the bridge pickup, so that middle position (combining the two pickups) cancels out interference. At the cost of changing the tone, it’ll at least taper the electromagnetic interference. If you have the luxury, use an axe with humbucking pickups. A single humbucking pickup is essentially two single-coil pickups in one, already canceling out interference. A good option to reach for when recording a quiet, clean part is a Les Paul with dual humbuckers. What if your amp is buzzing regardless of whether your guitar is plugged in or not? Chances are this finicky problem is a grounding issue or a ground loop. Without going into a bunch of incomprehensible electrical babble, here’s the skinny. An electrical amplifier chain should be grounded. The AC lead from the amp, the extension cable, the power strip, and the outlet should all be three-pronged. Your guitar cables will also have shielding to carry interference to the ground. Lastly, the ground loop. Let’s say that an amp and an audio interface in a studio are plugged into different electrical outlets on different walls. Even though they’re wired to a single breaker box, sharing a common ground, the voltages at those two outlets will be slightly different from one another (say, 115V vs. 122V). This voltage difference is small but important. If someone wants to record the line output of the guitar amp, that will mean directly connecting the amp and the interface, and thereby creating a new connection between those two wall outlets, with their slightly different voltages. This will likely result in a noticeable, lovely, 60Hz hum. Source power from one outlet. Set up a power strip and run power to all devices from it. That way they share the same ground and avoid creating a “loop” between two grounded outlets that might have different voltages. NOTE: DO NOT break the ground going from your amp to the wall outlet of from your pedalboard to its outlet by using a three prong to two prong ground lift adapter. Ground is there to protect you from POTENTIALLY FATAL SHOCKS. It’s just not worth the risk. Use a noise gate. The gate should be at the top of the signal chain and should open only when the guitar is played. This is particularly effective in rock projects where the guitars are pretty aggressive, since the guitar sound itself will mask most of the noise. Use a de-noiser. If the part is more delicate, it might be necessary to eliminate as much extraneous noise as possible. De-noisers from Waves, iZotope, and other companies are incredible tools for removing unwanted amp noise. These plug-ins “learn” the noise profile of a sound by analyzing a clip of the noise, flip that noise out of phase, and then apply a selectable level of noise reduction. The only drawback is that this will likely alter the harmonic content of your sound. Use Filters. Using a high-pass filter (around 80–100Hz), you can cut the 60Hz hum directly out of the signal. This won’t affect the frequency content of a guitar too much. Similarly, you can use a low-pass filter around 10–15kHz to remove any unnecessary high interference or hiss. As always, clean tracks start with clean recordings. Still, noise is part of the world of guitar music — there will always be some. It’s up to us and our tastes to determine how appropriate it is for the music we’re making. John Hull is an engineer, composer, and mixer, and the lead producer for most Soundfly courses. One-half audio nerd, one-half guitarist, and one-half fisherman… John Hull sometimes talks about synthesizers in his sleep. He enjoys long walks on the beach (as long as fishing is involved) and creating videos and songs. Special thanks to Marty Fowler and Austin Stillwell for fact-checking and suggestions. Soundfly offers personalized learning experiences, mentorship services to help you crack your musical problems, and creative courses to get you to the next level. Learn more at soundfly.com.